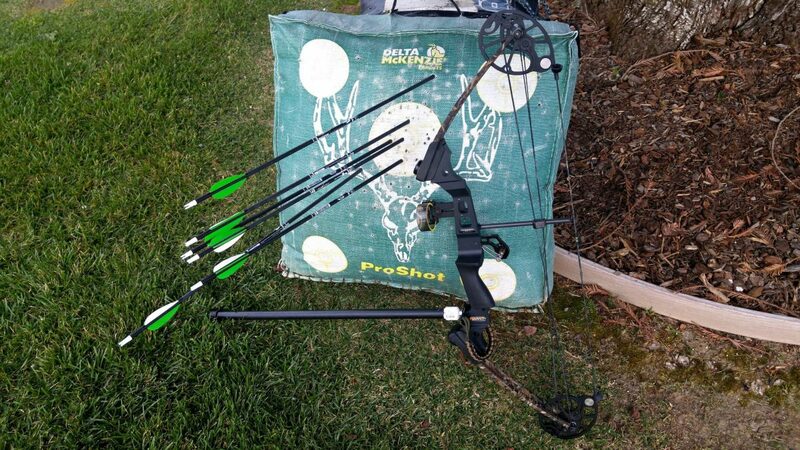 Today I decided to dig out my mission compound bow from the closet, tune it up, and do some target shooting with it. Can I still hit some bullseyes with it after all this time? Let’s find out. It’s been a long time since I have shot compound, I used to shoot sighted compound competitively, but only for a brief time. It quickly became stressful, and kind of sucked all the joy out of shooting for me. This was mainly because of some pretty bad target panic that caused me to jerk anytime I got near the target. However, this has gotten a lot better since I started shooting archery the same way I shoot slingshots. So slingshot shooting has really helped with that, and now it is quite enjoyable again. Sadly it still gets annoying if I do it too much. Since the time when I stopped competing in compound archery, I got into making and shooting my own PVC bows, which is super fun, and in many ways more rewarding than shooting purely for accuracy. I have found that traditional (canted, instinctive) recurve shooting is when I have the most fun with archery, but I still haven’t got my hands on a legit bow. I love my PVC bows, but they are a lot slower per pound of draw weight than a legit bow, so it gets a little annoying at times. One day I hope to get a real recurve, but for now, I’ll just stick to shooting my PVC bows, and my compound bow from time to time. Really hope you enjoyed. If you did, please leave me a like or a comment down below, and consider subscribing for more videos on metalworking and primitive homemade weapons. Wow, this was awesome. Keep writing this kind of posts, you will get a lot of people to this blog if you continue writing this.